Fossil Firsts is a multimedia campaign. This campaign is starting a movement reminding you of not only your first watch but also the memories associated with that watch. Some customer’s first watch was likely a Fossil watch; however, Fossil knows that the customers have changed, and so have they. 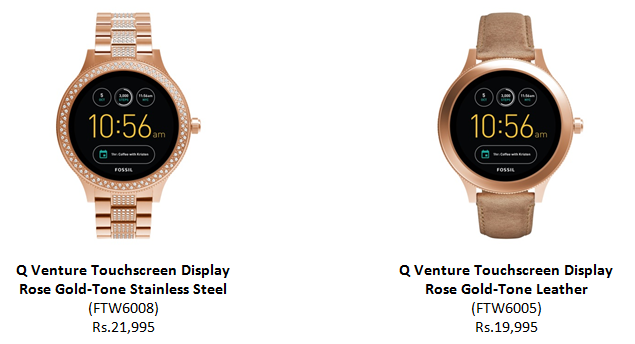 Fossil also introduces the Fossil Q series including various types of smartwatches, with fashion and design as the cores. And these are ready to become everyone’s first smartwatch. Fossil collaborates with influential Korean celebrities, Ji Chang Wook and Song Ji Hyo for this campaign. This campaign also celebrates their “firsts” and how these milestones shaped them to become the entertainers and persons they are today. Speaking on the collaboration, Mr. Johnson Verghese, Managing Director, FOSSIL Indiasaid, “We are very excited to partner with young, refreshing talents like Varun and Shruti. They not only represent the next generation of Fossil fans, they also personify a rare blend of talent, class, intelligence and popularity. More importantly they complement FOSSIL’s legacy and brand ethos which hinges on three pillars – timeless style, authentic inspiration and spontaneous creatively. Both actors will be endorsing our latest Gen 3 touchscreen smartwatches in a multi-media campaign which is all set to kick off. The campaign aims to appeal to the discerning Indian customers, who seek the best of both fashion and technology. We firmly believe this engagement will open up new avenues for us to engage with a broad set of young consumers. We extend a very warm welcome to both actors and look forward to a fruitful journey”. A perfect balance of smart function and fashion, Q Venture and Q Explorist pack the power you need to efficiently accomplish all your daily tasks in our smallest case shape to date. Both watches feature our first ever full-round touchscreen and run on Android Wear 2.0, which is the platform’s biggest update since its launch in 2014. This update truly expands the smartwatch experience through features like downloadable standalone third-party apps and watchfaces on Google Play, user-friendly notifications and messaging, and help from Google Assistant*. Qualcomm® Snapdragon Wear™ 2100 processor and 4GB of memory as well as Bluetooth and Wi-Fi connectivity. The Android WearTM App connects both iPhone and Android phone to your smartwatch. You can receive alerts from all your favorite apps as well as timely information from Google Now and notifications of incoming calls, texts, social messages and so much more. Q Venture and Q Explorist possesses up to 24 hour battery life and can be charged on wireless charger at ease. They are connected via Bluetooth® technology and compatible with iOS 9.0+ and Android 4.4+. Q Venture features two styles – luxury and classic. The new luxury style makes the touchscreen smartwatch an exquisite accessory thanks to rose gold-tone stainless steel bracelet and sparkling stones. The classic one crafted with a soft curving, multi-finish case, making it simple yet traditional. Q Explorist highlights the classic rugged design to showcase the tough and mature characteristics of men. The interchangeable straps allow users to create their own style for various occasions. Talking about the association, Actor Varun Dhawan added, “It’s a privilege to be associated with FOSSIL. I have always admired this iconic brand and am particularly excited to be the chosen one to launch the GEN 3 Fossil Q touchscreen smart watch collection. The decision to be a part of FOSSIL links back to my natural affinity with the brand’s values and personality in many ways. I look forward to being an integral part of the FOSSIL family and its fascinating growth journey in India”. Android Wear 2.0 brings the Google Assistant* to your wrist. Simply hold the power button on your watch or say “Ok Google”. Set a reminder, ask about the weather or ask for directions. Android Wear 2.0 brings an improved Google Fit workout experience. Users can now measure calories, pace, distance, and additional exercises based on settings. Users can track runs, bike rides, strength training (including squats, push-ups, etc. ), and more. As long as there is a connection to a cellular network or Wifi, users can stay motivated while working out by streaming music right from their watch. All Fossil Q wearables are compatible with Android™ 4.3 and higher, iPhone 5 and above (running iOS 9 and higher), and connects via Bluetooth technology. Fossil is continuing to update its software capabilities to provide enhanced customization experiences to the consumer. App enhancements will include social sharing, custom categories for saving watch faces, and changing your watch face background to an Instagram/Facebook photo. What differentiates Fossil from other existing watch apps is that we are able to change the background on multiple watch faces. The list will continue to expand when we launch additional watch faces in January. Android Wear and Android are trademarks of Google Inc.
FOSSIL’s newest smartwatches aim to make consumers and the brand ambassador’s daily lives more efficient without compromising their personal style. Both celebrities were chosen both for their unique personal style as well as their integral relationships with the brand. Fossil Gen 3 smartwatches represent the next generation of watches, and these celebrities represent the next generation of Fossil fans. India becomes the second country in the subcontinent, close on the heels of South Korea, to engage celebrities to represent the brand in the country. 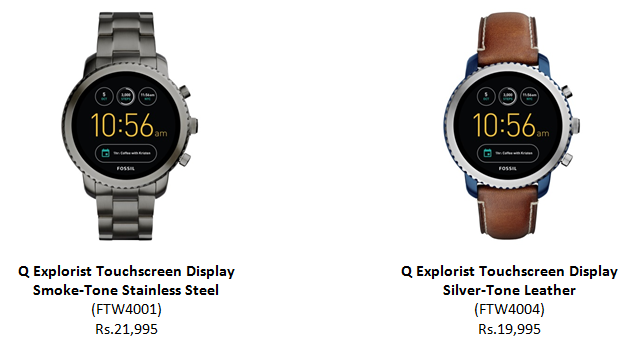 Fossil Gen 3 smartwatches are priced between Rs.19,995/- to Rs.21,995/- and are available in all exclusive Fossil retail stores and select doors across the country.